When you're off to begin a new journey, you want to make sure that you have a vehicle you can depend on. 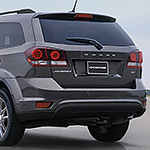 The Dodge Journey is up to the task with its award-winning 3.6L Pentastar V6 engine. The new Pentastar engine teamed up with AutoStick, front-wheel drive and six-speed automatic transmission to provide you with a stellar performance experience. How about traveling in style? With the Dodge Journey's Blacktop package, you'll be running the road in a beautifully design blacktop finish that features a glass black grille, exterior mirrors and headlamp bezels. Finish the look off with 10-inch all black gloss aluminum wheels, and you'll look like a phantom journeying through the night. Interested in learning more about this vehicle and how you could be well on your way to owning one? Contact Planet Dodge Chrysler Jeep RAM today!